From insidious murder weapons to blaze-igniting crinolines, clothing has been the cause of death, disease and madness throughout history, both by accident and by design. For the February book of the month, Address editor Johannes Reponen reviewed Dr. Alison Matthews David’s new book, Fashion Victims (2015) about deathly clothing. Fashion history is most often told through the lives and works of celebrated fashion designers and charting the changes in silhouette of female dress. Little attention has been given to the everyday aspects of clothing as well as other, alternative ways of understanding fashion’s trajectory from the past to the present and its impact on society and visa versa. However, as the still relatively young discipline of dress history is starting to evolve, more nuanced ways of unravelling the past are starting to emerge. Published in 2003, Caroline Evans’ book Fashion at the Edge, looked at the works of fashion designers through the lens of death, trauma, alienation and decay, by combining scholarly analysis, poetics and stunning imagery. This provided a template for a less linear, and more thematic way of understanding clothing and design. 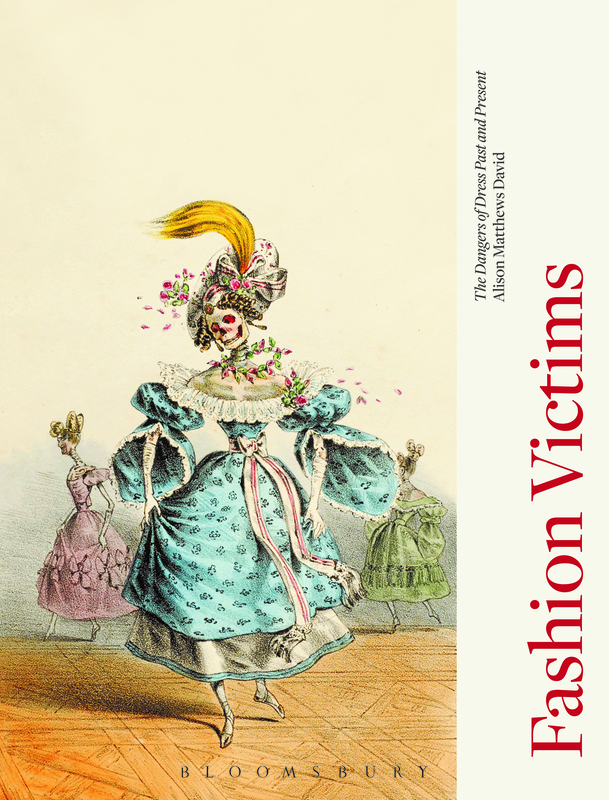 In the same, somewhat morbid vein, Dr. Alison Matthews David’s new book, Fashion Victims (2015), opens a new perspective on reading past fashions. The book takes the reader on a dark journey though the lethal history of women’s, men’s and children’s dress by combining object based research, science and medicine. By positioning clothing as the cause of death, diseases and madness, the book illustrates the sinister history of these most intimate of objects with their close proximity to the body. This contrasts with the usual expectation of clothing being about shielding and protection. 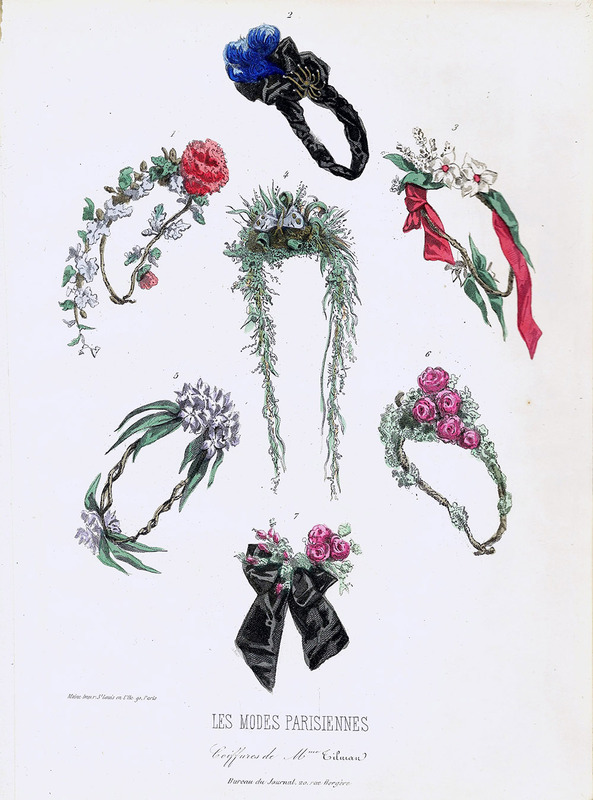 Arsenical wreaths from the Maison Tilmans, Paris, Les Modes Parisiennes, January 24, 1863, Author’s collection. Divided into seven chapters, the focus is predominantly on poisonous dyes and production processes and this focus spreads across half of the book. The reader will learn about the use of mercury in hat making, nitrobenzene in shoe polish and other toxins that went into producing colours such a violet, mauve and red that, in turn, caused deaths of both the makers and wearers. Use of arsenite in green dyes which poisoned decorative head-wreath-makers, fashionable in the 19th century, has contributed to the negative superstition around this viridescent shade that still lingers in couture houses today (mentioned for example in the 2005 documentary Signe Chanel). Against the extensive sections about poison dyes, chapters about poor hygiene, inflammatory materials and machine-based accidents seem separate, although still equally fascinating. In the rich socio-historical context, the story about prevailing attitudes, developments in urbanism, fashions for interior design and material innovation is told as an alibi for the way in which a deathly veil was cast over clothing. Examples include the hobble skirt with its movement-restricting cut, in vogue between 1910 – 1914, which, in turn, caused a number of transport accidents as automobiles and city transportation developed. Light silks and muslins as well as excessive crinolines proved to be fire hazards in the age when houses were lit by candles and gas lighting, making the interior context the killer whilst framing the poor clothing as the perpetrator. Meticulously researched and referenced, filled with interesting historical facts and anecdotes, Dr. Alison Matthews David narrates this dark journey through clothing with authority and precision that is light and joyful to read. Fantastic frock pictures and gruesome medical illustrations along with paintings, photographs and fashion plates help to bring the story alive (no pun intended) making up for the otherwise twee and somewhat dated art direction of the overall book. Bringing literal meaning to the concept of ‘drop-dead gorgeous’ gowns, Fashion Victims is a book that contributes to a richer dialogue about the way in which we think about clothing and dress and how it affects us culturally, emotionally and sometimes even, lethally. 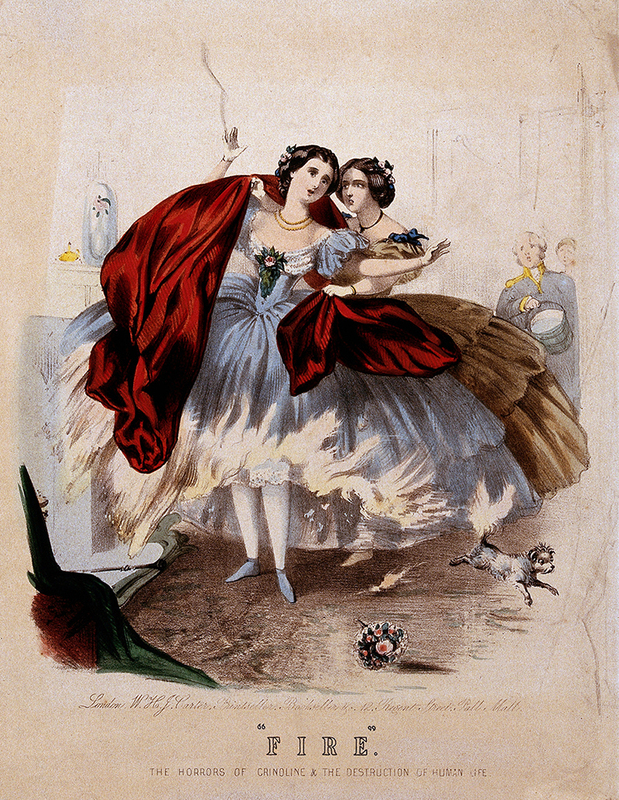 ‘Fire:’ The Horrors of Crinoline and the Destruction of Human Life, hand-coloured lithograph, Wellcome Library, London.